The Big Data Platform Trustable Computer Protection System, developed by Guian-based Huaxintong Semiconductor Technology Co, was recently listed among the 2018 Big Data Industry Demonstration Projects. The National Astronomical Observatories of the Chinese Academy of Sciences in Pingtang county of Guizhou province have announced on Oct 15 the naming of asteroid 79694 after the Chinese scientist Nan Rendong. In order to promote regional development, the Guizhou government signed a strategic cooperation agreement with China Minsheng Bank (CMBC) in Guiyang on Oct 15. From Oct 28, Colorful Guizhou Airlines will launch three new routes from Maotai Airport to Jinan, Nanchang and Guiyang. The digitalization of tourism is aiding in the streamlining and improvement of the industry, with Guian New Area's tourism and culture center able to analyze tourist numbers and revenue to plan future projects. A transport and tourism station located in Qingyan town in Guiyang's Huaxi district, Southwest China's Guizhou province was put into use on Oct 10. 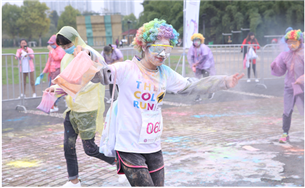 Guiyang, the capital city of Guizhou province, hosted its first five kilometer color run at Guanshanhu Park on Oct 14. In the first three quarters of this year, Guian New Area has attracted 45 new projects. Among them, 19 were projects with an investment of more than 50 million yuan ($7.21 million) and 15 projects had a total investment of over 100 million yuan.